“Doubting Thomas” will be focus of many sermons this Sunday in congregations that use the Revised Common Lectionary. The story of Thomas in John 20:24-31 is assigned every year because it occurs the week after Jesus resurrection. In the story the other ten disciples tell Thomas, “We have seen the Lord,” after he missed the first resurrected appearance of Jesus on Easter Sunday. 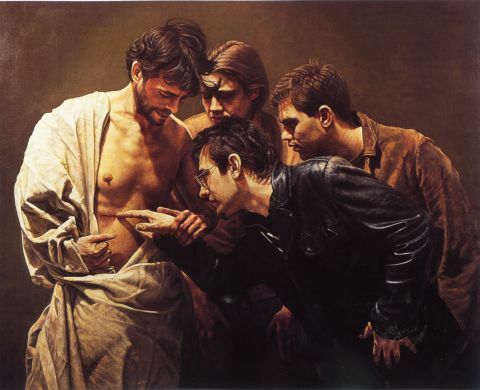 Thomas responds with skepticism, “Unless I see the mark of the nails in his hands, and put my finger in the mark of the nails and my hand in his side, I will not believe” (John 20:25). Today I read a helpful blog post on the challenges of being selective in our skepticism from TE Hanna. He points out that one cannot be semi-skeptical as one looks at the data of faith. Either you look at all or none of the evidence. I am not a philosopher, but his reasoning helped me think about faith and Thomas. A certain amount of skepticism or doubt is needed in daily life. So much information assaults our senses every day that we have to filter what is valid and helpful. Not everything I see on the internet, read in a book, or watch on television is true. We are not to be gullible to everything someone says. Of course part of our skepticism is based on the character of the witness. Last week I was with a group of pastors for our weekly text study when one began to tell us the story of his upcoming trip to Rome. He and his wife had been planning it for several months. He had told a Catholic priest, a friend, and the priest had told, “I think I can arrange an audience with the Pope while you are there.” My pastor friend went on for a few more minutes about his excitement about the upcoming audience while I and others peppered him with curious questions and exclamations about how wonderful his audience with the pope will be. Finally, with a big grin, my pastor friend said, “April Fools.” The papal audience was a joke that he played on us, though the trip to Rome is real. The whole group had believed his story, in large part because he rarely tells such fables. He had always been a reliable witness. That is part of the struggle in the Thomas story. When confronted by his ten friends, he is sure they must be bearing false witness. As I wrote about this last year, I wonder what the week between appearances was like for Thomas and the other disciples. Which pushes me to deeper reflection, is my life congruent with my testimony of Jesus’ resurrection? Do people believe in Jesus because my life and my words bear witness to his resurrection? I pray that this is so for each of us. Lord Jesus, may my words and my deeds bring deeper faith in you to others. This entry was posted in Bible, Jesus, Resurrection, trust and tagged doubt, John 21, Thomas on April 11, 2012 by Pastor John Keller. I wonder too what the week was like for the disciples. It seems they go back to their livelyhoods. Some are fishing and Thomas is not with them the first time Jesus appears. Did they give up hope now that Jesus was gone? Thank goodness Jesus came back to send them off on their mission to be his witnesses and for His gift of the Holy Spirit that came next. Now that is our mission. I pray too that I can be bold and tell of our Savior to others. Great post. And I am in love with this picture. I was at a meeting in Adrian, Michigan, with some other Dominican sisters and showed it to them. They, too, thought it was great. Could you please tell me more about it? Gregory emulates the style of Caravaggio, using contemporary and realistic figures to show the story of Thomas encountering the Risen Christ. From Fr. James B. Simpson and George H. Eatman’s A Treasury of Anglican Art (New York: Rizzoli, 2002). Courtesy of Mr. Eatman. I went to school with, and am still in touch with, the artist. An incredibly talented man. Could you please tell me, if is possible, where one could purchase a copy of this work? It is a fabulous picture and even a print would be fabulous.